The mural will be painted over at 11am on Monday. 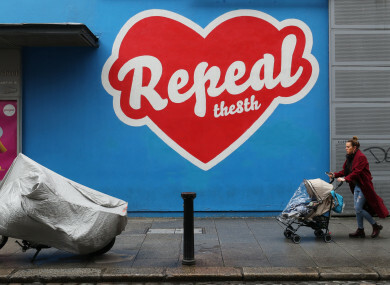 A MURAL SUPPORTING repeal of the Eighth Amendment is being taken down from the front wall of Dublin’s Project Arts Centre because the centre risks losing its charitable status if it remains. The artwork, by street artist Maser, was first erected in July 2016 only to be removed less than a month later because it was found to be in violation of planning rules. It was erected again on April 9 with the centre explaining that the new mural didn’t need planning permission because ads for elections and referenda are exempt from planning permission, once they are removed by seven days after polling. However in a statement released this afternoon Project Arts Centre explained that it will be painting over the mural again because it risks losing its charitable status if it allows it to remain. “The Charities Regulator has informed Project Arts Centre that the display of Maser’s ‘Repeal the 8th’ artwork is ‘political activity’ and that we are therefore in breach of the Charities Act 2009 and not in line with our ‘charitable purpose’,” the statement reads. Should the artwork not be removed, we risk losing our charitable status. Project Arts Centre respects the authority of the Charities Regulator and will comply with their order to remove Maser’s artwork. The mural was commissioned by The HunReal Issues, a website that promotes women’s issues. “We played by all the rules but when ppl [sic] put their minds to finding more rules, they’ll always find something,” the website said on Twitter. “The Board and executive of Project are conscious of their obligations under the Charities Act 2009 and the charitable purpose of the organisation,” the chair of Project Arts Centre, Fiona Slevin, said. We strive to sustain Project’s stated purpose and objectives, namely to remain Ireland’s leading centre for the presentation and development of contemporary art, and to work with artists across all art forms to make and present extraordinary works that inspire and provoke. The artwork by Maser fits precisely with this remit. The mural will be removed at 11am on Monday. The referendum on the repeal of the Eighth Amendment will take place on 25 May. Email “The Repeal The Eighth mural in Temple Bar is being taken down... again”. Feedback on “The Repeal The Eighth mural in Temple Bar is being taken down... again”.